Oh man, have you read Jon's latest post on the Stern blog yet? I'm so jealous that he got to do a factory tour! He gave me the COMPLETE (2+ hour) rundown of his whole trip, and it sounded pretty amazing. He had his tape recorder with him, so get pumped, because we have A LOT of awesome content for the next couple of issues of Drop Target Zine! Tomorrow I'm heading to Belgium to visit our old pal Max! Readers of Drop Target Zine will remember Max from his many appearances in From Zeros to Heroes, his "Zine King" center spread from DTZ #3 and some of the cool posts he shared with us about his Dad's 1935 Par Golf and his Carcassonne Pinball Adventure. Fear not, Dear Readers, I will keep an eye out for pinball machines during my travels, and have a write-up prepared about the European Pinball Scene upon my return! 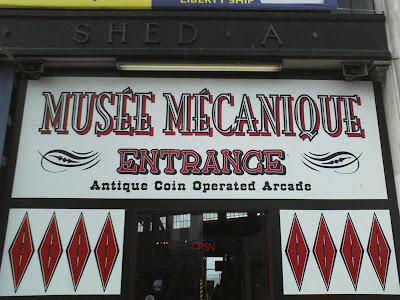 The last stop I made to play pinball in the Bay Area was at the Musée Mecanique in San Francisco's Fisherman's Wharf area. This is one of Claire's all-time favorite places to hang out. It's got anything and everything coin-operated. Fortune tellers, nickelodeons, player pianos, photo booths, and pinball machines! I can't even remember where I heard about Hyperball, but I never thought I would see one that worked. 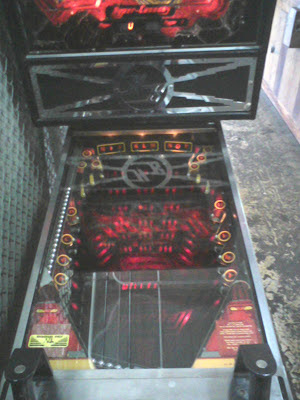 This game (designed by Steve Ritchie and manufactured by Williams in 1981) is not technically a pinball machine, because there are no flippers. 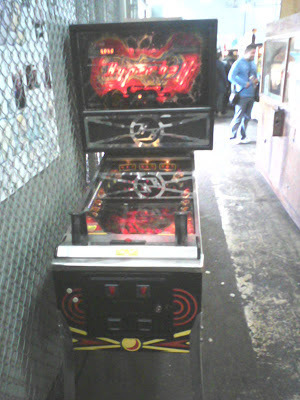 Instead you have two handles which pivot left and right to aim a small cannon at the base of the playfield. Instead of standard 1 1/16" pinballs, it fires 3/4" balls, and a lot of them! Maybe 50 or so? The ipdb.org page says it can shoot 250 in a minute! There are 26 targets around the playfield (A-Z) and you try to shoot your balls at whichever one is lit. If you look closely on the left here, you can see all the balls lined up. Crazy right?! Sadly, I only had enough change to play two games, and I was not very good at it. But I will be back! Oh yes, I will be back with change to spare and then many a game of Hyperball will be played! Jon and I have one last summer to play some pinball together in New England while I am at CCS teaching some of the summer workshops, and then I will be in Oakland for good starting in August. I'll continue to let you all know what machines I find and play in my new surroundings. 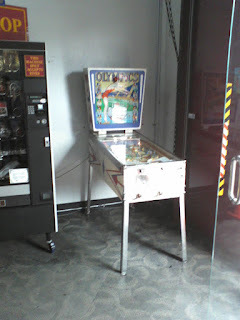 Pinball in the Wild: Part 3 - The Pacific Pinball Museum! I'm not sure The Pacific Pinball Museum counts as "in the wild" because their collection of games is carefully curated, their old woodrails have been meticulously restored and all the games are perfectly maintained. It is without a doubt one of the great pinhalls out there, and no trip to the Bay Area is complete without visiting this fine establishment! So I walk in the front door and the guy behind the ticket table is reading Drop Target #4! I said to him, "I'm Alec Longstreth! 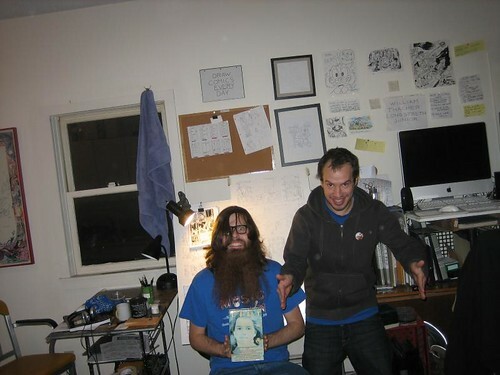 I make that zine with my buddy Jon!" The guy (whose name I have forgotten - sorry!) asked me to sign the copy, and as I was doing so he said, "You'll never guess who's here... Keith Elwin!" 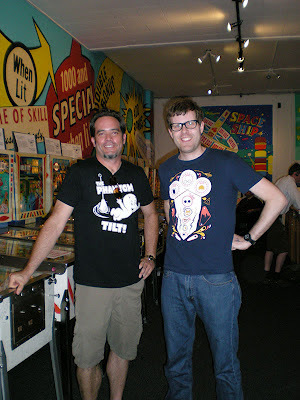 This was especially cool, because Jon and I had interviewed Keith in DTZ #4 and reviewed his Pinball 101 video. I introduced myself to Keith and asked if I could get a photo with him, which he said was okay. I'm glad I wasn't the only one wearing a pinball shirt at this place! 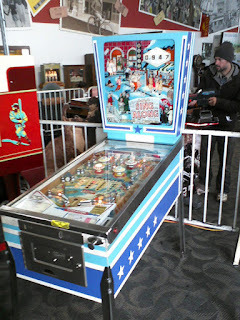 I guess there was a big pinball festival somewhere North of the Bay Area and Keith was in town for it. I didn't have a car, so I couldn't get up there, but I still got a pinball fix at the PPM. The cover charge is now $15, so I was determined to get my money's worth. I play a lot of the 80s and 90s machine in the back room, and then when I started getting burned out, I moved to the quieter front room to play some older machines and read the historical info on top of each one. When I caught back up with Claire, she was having an awesome game of Road Show. At the end she got to enter her initials for the #2 score. We were both kind of amazed by this. 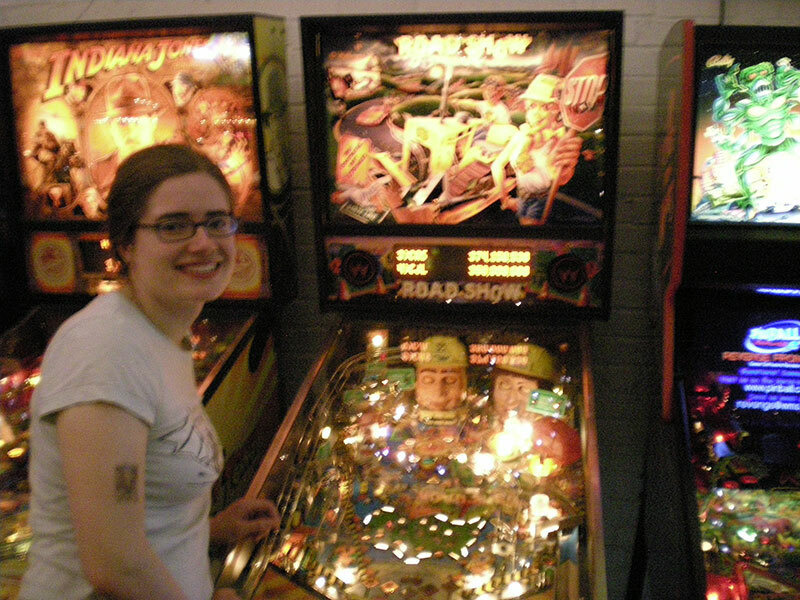 Don't get me wrong, Claire is a pretty darn good pinball player, but #2 at the Pacific Pinball Museum?! It turns out that it was the #2 score of the day. A feature I didn't even know existed! Now I want to see if I can turn that on for my Medieval Madness. I like the idea of more people getting the thrill of entering their initials into the machine. After hours and hours of playing these machines on free play, I dropped a few quarters into the pay machines in the lobby. I tried the new AC-DC machine (with dropped playfield!) It was a lot of fun. 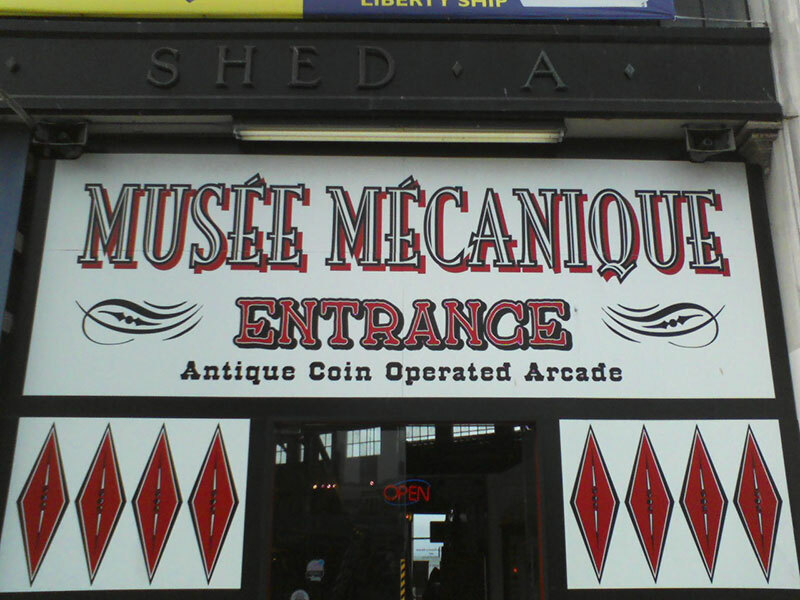 NEXT UP: The Musée Mecanique!